Click the picture below to learn more details about our BOOK DRIVE for 2017 and our new partner READ & FEED! New Collection of Picture Books! So... we have a beautiful new growing collection of children's and illustrated books in our library. For quite a few years Ms. Deaton has been gradually collecting these books to read to her weekly special education classes. Over time, the Reader-Leader's have been taking over the job as reading buddies which has also prompted Ms. Deaton to expand the collection of these amazing picture books. 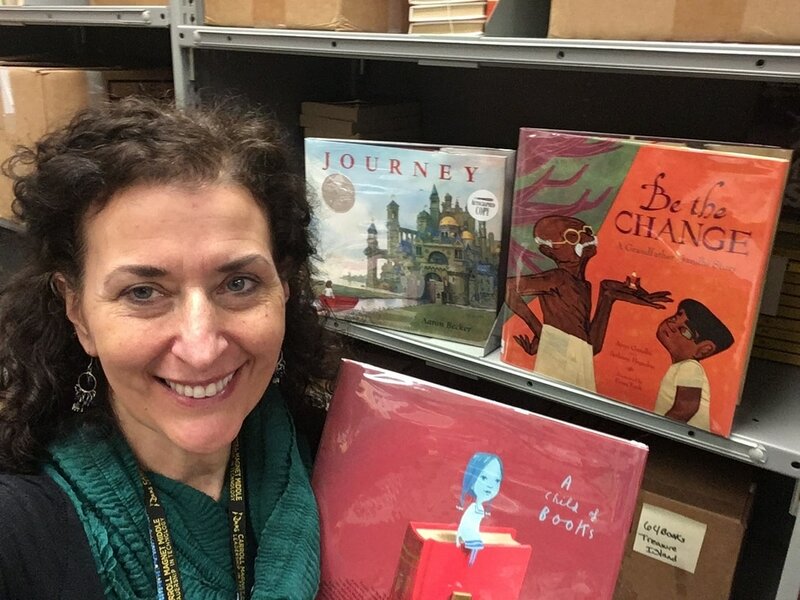 So, you might ask "Are picture books relevant to middle school students?" Well.... keep reading! 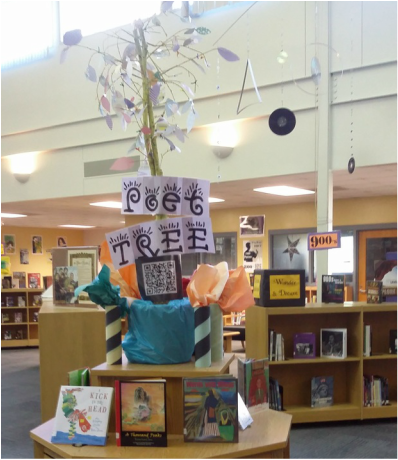 On April 17th, Ms. Bateman and Ms. Deaton and four Carroll students led a session called ART OF THE BOOK, which featured two collaborative projects. One was an artistic rescue of many of the old books that were weeded (removed) from the library. Ms. Deaton gave carts of old books to Ms. Bateman to play with. 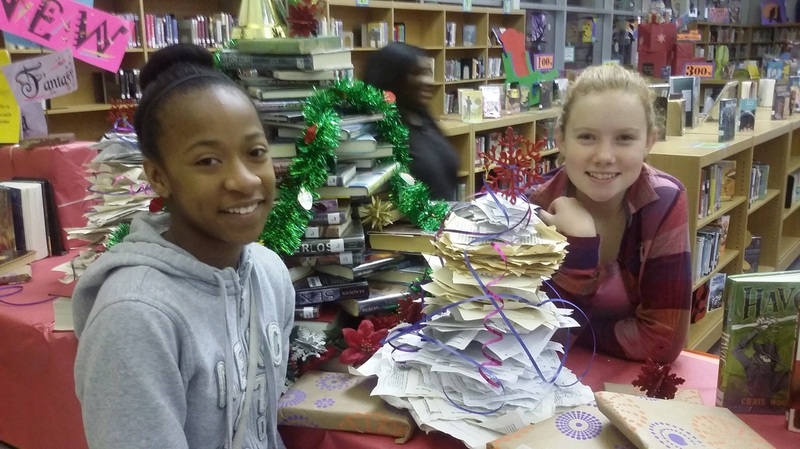 She then encouraged her art students to create book sculptures. The results were so imaginative and a true honor to the beautiful life that these books had lived. 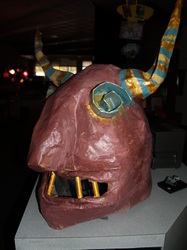 Many are on display in the gallery space in the Library Learning Commons. The other project that the team presented on was the Children's Storybook Collaborative where Ms. Deaton's Reader-Leaders created stories, and Ms. Bateman's students did illustrations. Many students were so inspired that they choose to be both author and illustrator. 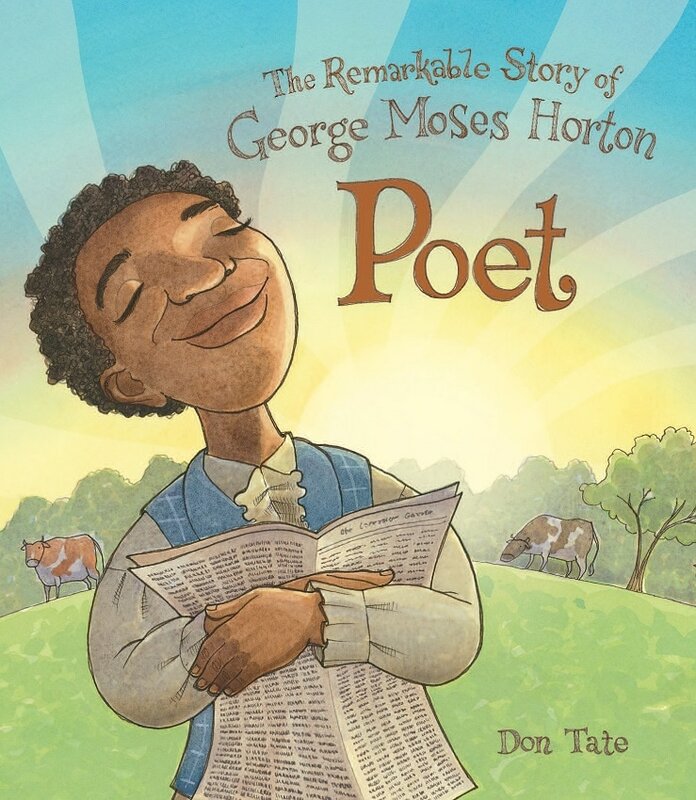 In addition to the great synergy of authors and artists, there was a special synchronistic bonus at the conference, the keynote featured Don Tate (illustrator) and Chris Barton (author) who spoke about their own working relationship as author and artist! Now THAT'S SYNERGY! Info Overload & just plain Confusion! There has been a lot of talk these days about the increasing number of fake news stories resulting in everything from outrage, to confusion and misunderstanding. What are we to believe when it is so easy to publish, and the news cycles are so quick that fact checking is not a regular part of sharing the news. When even journalists who have a degree get duped, then what can we expect of our students. TIP #1 BUILD a HABIT to have Critical Discussions! I have a FAKE NEWS page with survey and resources for you and students. I am also going to do a PD at March Edcamp on RESEARCH where I hope we can collaborate on the issues, problems and solutions! All of this was kicked off during February circulation, and we'll continue the conversation in March as a faculty team! 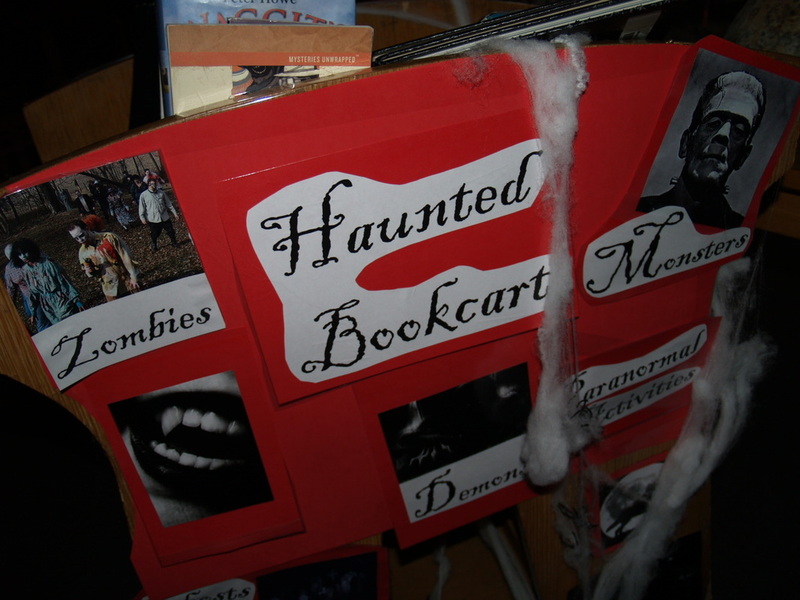 READER-LEADERS are using a wide variety of ways to share the stories that they are reading. The big project for quarter two is to come up with a way to share the book. The requirements were wide open...some students choose a live skit, some a piece of fan fiction, others a diorama, and others a mash up of media all incorporating the essence and some quotes from the book. The students in the video decided to create a newscast describing the day Malala got shot by the Taliban. While they were recording their newscast I snuck up behind them and took the video and edited on iMovie. Stay posted for the finished projects! CAN I MAKE THE NEWS? 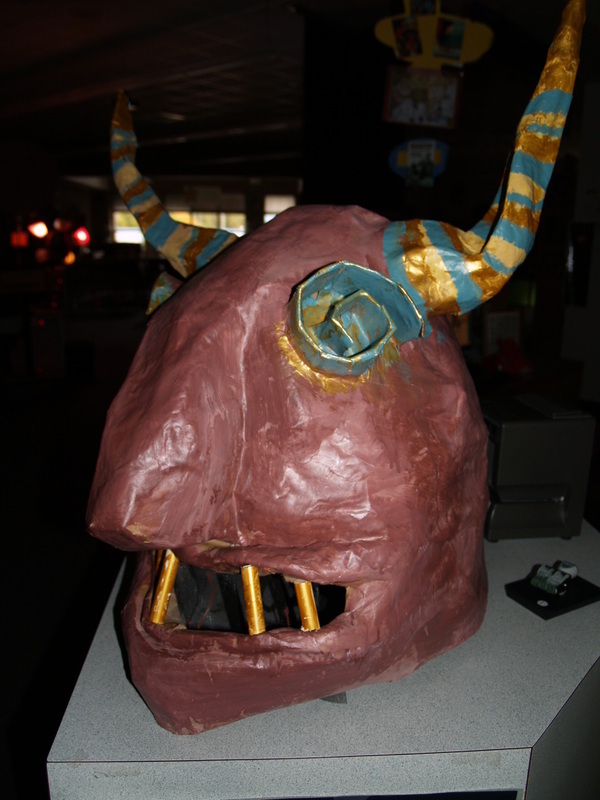 Sometimes student projects are a little overwhelming...especially if there are a lot of little details to consider. One thing that Carroll students have been doing a lot of is making movies on their iPad. It might be nice to have a fancy news desk and a green screen, but maybe you can make the news with a few basics. You can use a Powerpoint Slide show with backgrounds that are used for a live performance or a pre-recording. There are many great places you can record to make an interesting video(like in the Learning Commons or on one of the cool cafe tables in the hallway where it is quiet). Avoid shooting against a window though to avoid backlighting. Ms. Deaton or Dr. Lanier could lead a mini lesson on some basics of framing, lighting as well as the planning process of making a video production. CHECK OUT the buttons below for quick links to lessons on 1) making the news and 2) making book trailers or other movie presentations. There you can find templates as well as resources like storyboard (a critical planning tool!). October tradition at Carroll involves a celebration of the end of the quarter with a Scholastic Bookfair the last week of October. 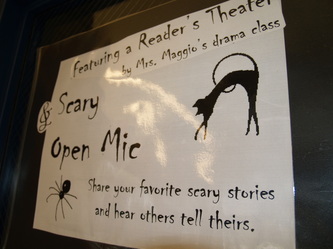 Gradually through the course of the month our beloved Learning Commons turns into a Haunted Library and setting for a Spooky Reader's theater. Stay posted for special events! 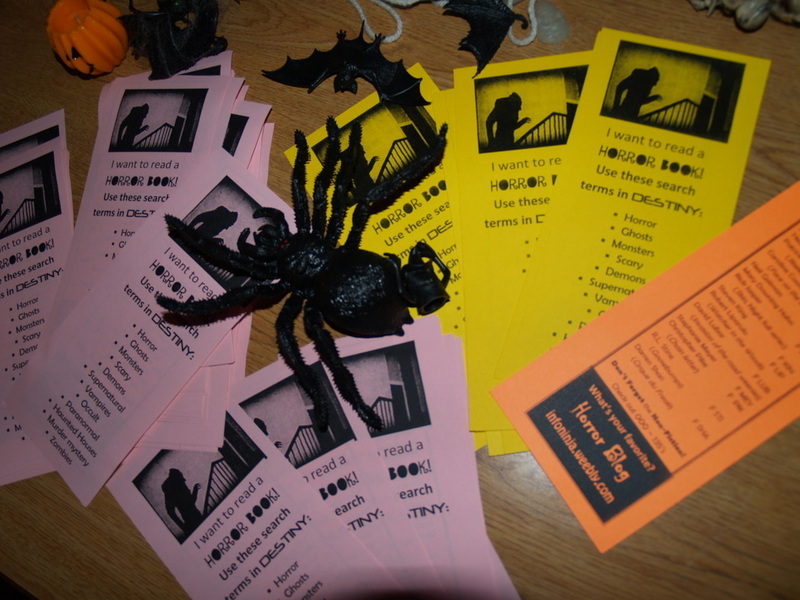 The OCTOBER Theme - MONSTERS INK - is not only about horror fiction, but also all sorts of frightening situations, from bullies and the bullied, to disabling conditions. Look for the displays that feature stories on Disability Awareness, as well as anti-Bullying month. READING about how others survive challenging situations can give us understanding, compassion, but also the strength and power to overcome our own "disabling situations" and the monsters we must face. Check out the NEW Magazines! There are MANY new print magazines available in the Learning Commons PLUS many links to other great on-line magazines too. 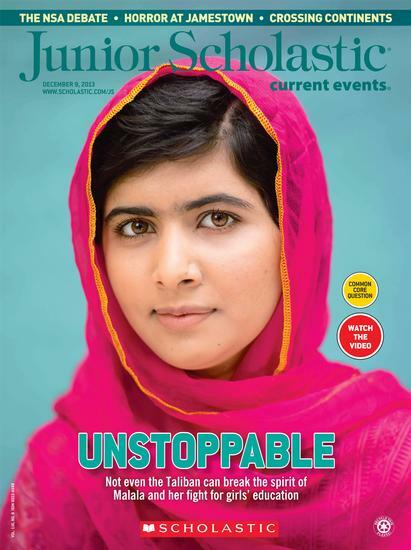 CLICK the Jr. Scholastic magazine at right for more links. 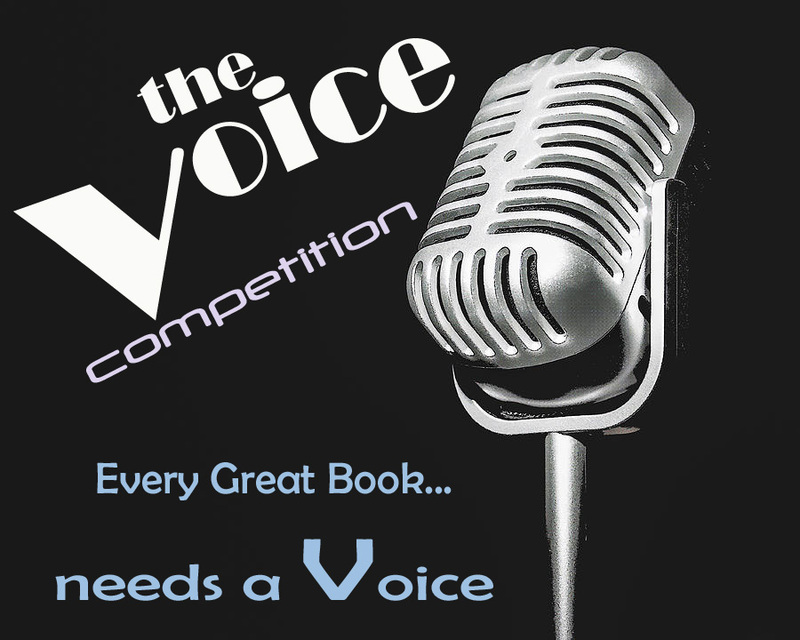 Click for details about the CONTEST! Need a surprise around the holidays? Ms. Deaton and her elves will be selecting great books to read based on your personal requests. 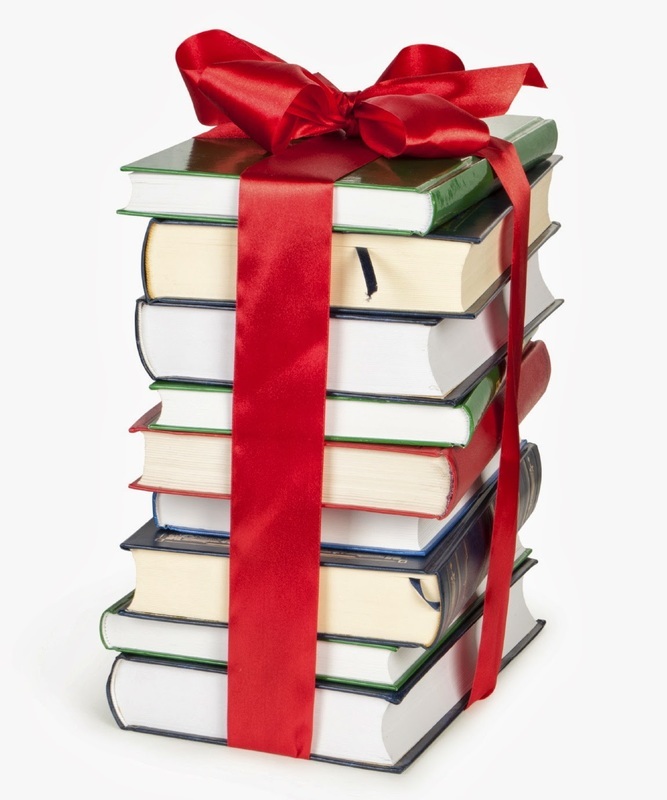 Click on the picture and fill in the short form to request a book that will be gift-wrapped and ready to pick up the day before the Winter Break. All Ms. Deaton asks is that you wait until the next morning to open your surprise! Make a cup of hot chocolate (or tea) and sit back and enjoy a hand-selected title, just for you! Dont forget to return the book to the Learning Commons in January! Apply to join the movement! Ms. Deaton will take applications this week. ​Learning Commons and pick one up. Building a Culture of Reading! Driving back from the World Library and Information Congress I had time to reflect on the phenomenal people I had the great honor of meeting. I met with leaders in the public as well as academic and school library worlds... literally from around the world. I presented a poster session on my experiences working with students as "Reader-Leaders" in after school clubs as well as elective courses. Standing with my presentation poster, I was engaged with people from Finland to as far away as Bhutan for two days connecting, sharing, and learning. Also... to my very great honor, I was asked by Blanche Woolls with ABC-CLIO (as well as many other illustrious titles to her name) to write an article for School Library Connections on the READER-LEADER concept to keep students at the center of what we do. If you are interested, please fill out an application (attached above or pick up in the Learning Commons.) Submit to Ms. Deaton ASAP! Last year our "Smart Lunch" system was really successful and I really loved that ALL faculty could come to the Learning Commons at least once a month. With the opportuity to come through the TEAM ELECTIVES, I am thinking of another great opportunity... time! Not only will you have access to the space for longer period but also I would love to provide mini-lessons on resources, research and CBL but also digital learning and anything for you and your students - MADE TO ORDER!
. . . in just 3 Years! MASSIVE UPGRADE to our COLLECTION! Click on presentation below to see the plan & the progress! All books are due back to the library by the end of MAY which is Tuesday the 31st. LAST Checkout of Books is Wednesday the 24th of May. 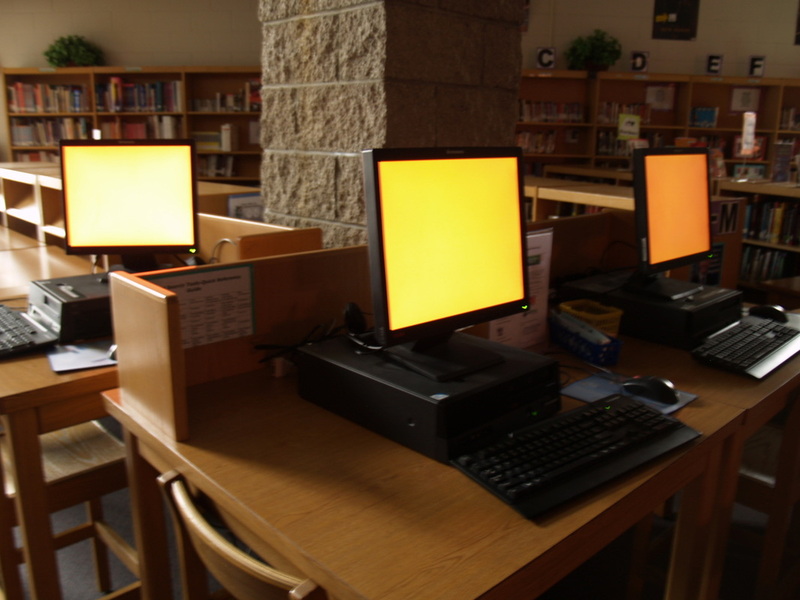 Please be sure to clear your library account of overdue fines and of course any overdue BOOKS. Ms Deaton will be collecting fines and cost of replacement for lost books. 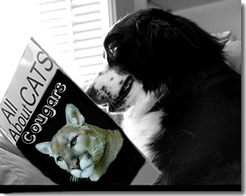 Please be aware that all books checked out to you will be on your account until you graduate high school. Check out the two videos below (the first one was made by the Friends of the Library club) to remind yourself of just why it is important to return your books so others can enjoy them. Through the month of APRIL CHALLENGE yourself to be creative! 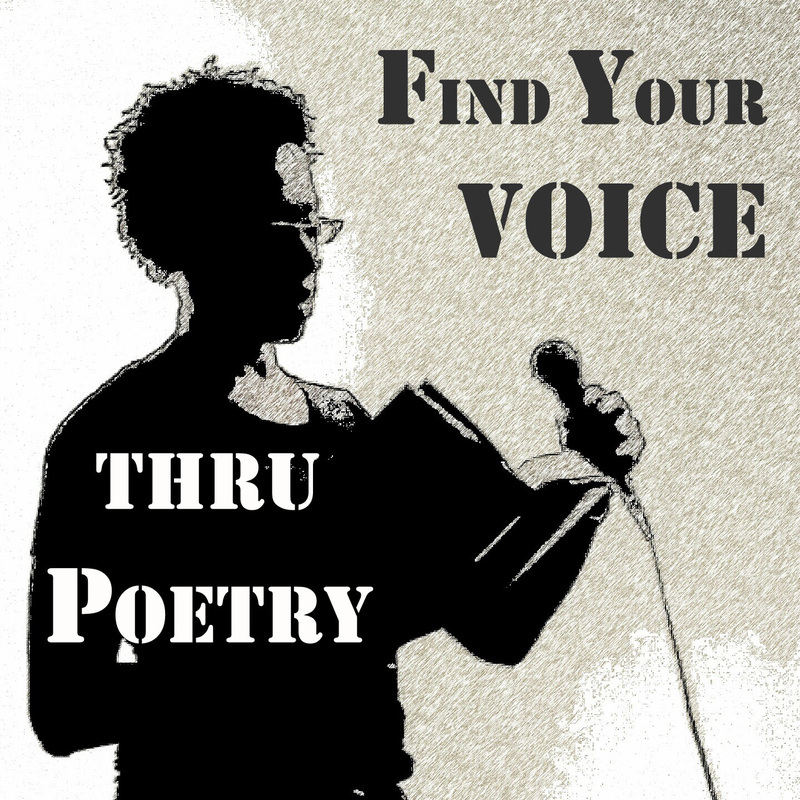 Turn your thoughts and feelings into poems! 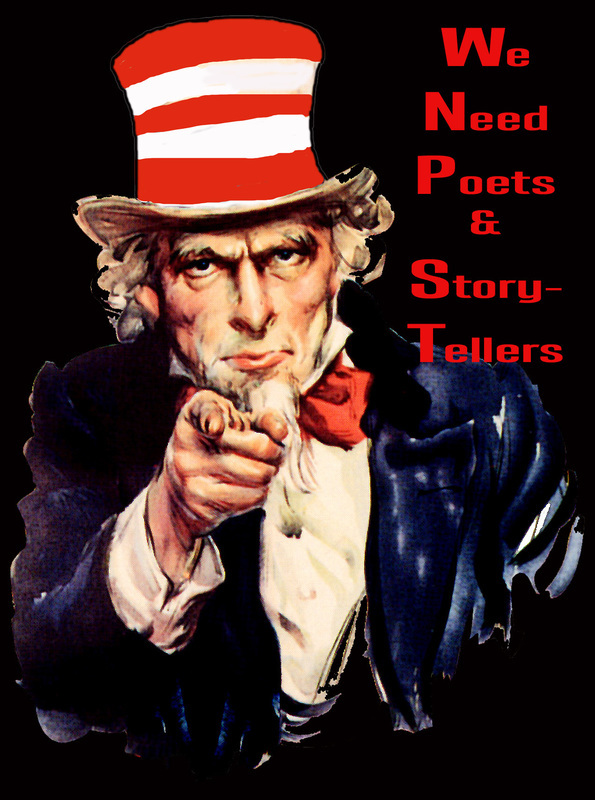 Why not spice up your messages, texts and tweets (#Carrollpoetrychallenge) in rhyme or haiku! 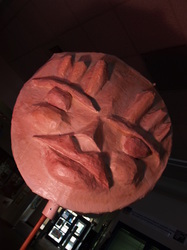 SHARE with everyone by posting it in the CREATIVITY THEATER [in the alcove in the library] covered in poems and short stories from students and staff. ​Learn more about the author visit on May 4th, Sean Flynn. Why they are so AWESOME! The first week of March we received over 50 boxes of brand new books, [purchased from a federal magnet grant]. I am particularly proud to share with our students, parents and teachers... the arrival of many new GRAPHIC NOVELS to Carroll. 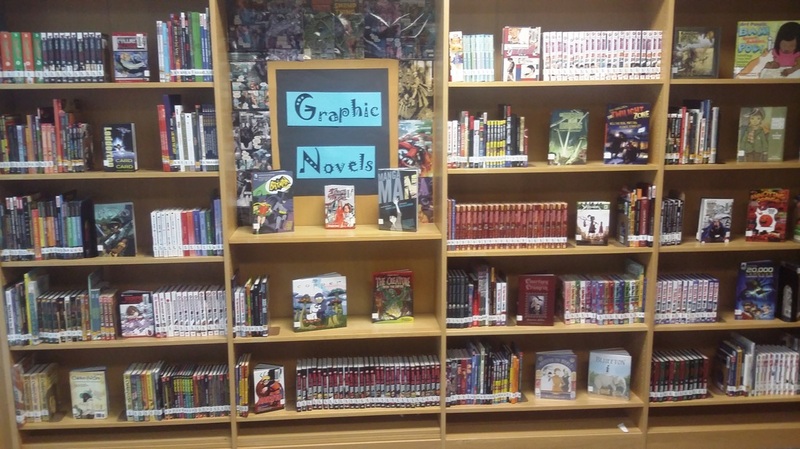 As of today, Carroll now has over 700 titles in the graphic novel section of the library. Seeing this beautiful new section of the library full on each shelf, it is the realization of a dream! Each library I have worked in throughout the county, I have identified this section to build, doing graphic novel drives and sometimes making personal donations to the library collection. 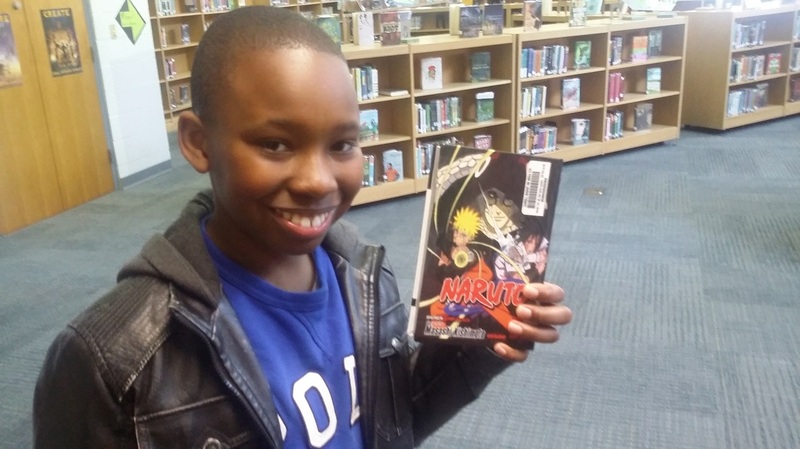 Graphic novels tend to be very expensive because of their popularity, and so when Carroll won a massive grant to upgrade the library collection, it was truly a thrill to see a dream realized. Keep an eye out for many MANY other books too, as the graphic novel section is just one tiny section of the library seeing a mighty upgrade: Leadership, biographies, STEM, multicultural, and many many other categories! The library Learning Commons will be hosting a big REVEAL in May so please come down and enjoy the beautiful new books. Let's get organized! What is best for you? I noticed that many people have a variety of questions regarding other platforms / formats for management of files and communication. At the next "unconference" we will discuss some pros/cons of other methods and platforms (such as websites or Google drive / classroom) as a means to stay organized and streamline your system. For example, you may not need Canvas if you can get the job done with a website or using Google drive or classroom. Like the February session, the meat of the session will be the opportunity to work on your Canvas site, OR other form of file management / ecommunication (website, Google drive) to get organized. Beginning Wednesday, March 9, 2016 at 6:00am, the login URL for Canvas will be https://wcpss.instructure.com. All users (both staff and students) will be prompted to log into Canvas using their WakeID credentials. NCEdCloud will no longer be used to access Canvas. This change does not impact course content or course enrollments. For the "unconference" bring your laptop and be ready to transfer your Blackboard content over to Canvas, or come to work on your new Canvas class. Every WCPSS teacher has been automatically enrolled in a CANVAS 101 course. PLEASE do this course before coming - - but if not - - come anyway and do it while the rest of the group works on transferring courses from Blackboard OR creating new content. You will log into NCEdCloud (until March 9) using your NCUID + your Lotus password. After March 9 please use: https://wcpss.instructure.com. You will see CANVAS as one of the icons. If you have not gone through the Canvas 101 training, please do so during the session. For those who have already completed the Canvas 101, start working on building class content or transferring your content from Blackboard. This session will be an opportunity to work as a team to learn how to use Canvas. We will learn and troubleshoot together! DELETE the export package to free up space (that is just archived garbage) This way Blackboard won’t crash while people are migrating content this Spring. 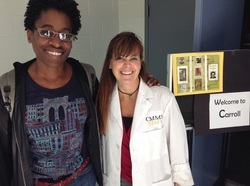 CBL and the Research Journey! CBL or "Challenge Based Learning" is a new initiative at Carroll that provides an authentic and student driven model for Discovery (ie. research) and Creation. You can visit the Challenge Based Learning website HERE. The faculty and student population at Carroll are on a journey to integrate principals of CBL for the next two years as a means to re-energize students as they approach learning and research with an emphasis on real world problems and student driven authentic solutions. ​ than other research models? Our CBL coach, Christine Yarzabek and Ms. Deaton will be offering an "unconference" on the Research Journey and CBL in December. Also, in January the CBL team will be hosting a professional development to facilitate more team planning of CBL units. As for the research portion of CBL, be sure to sign up for the December session if you have an interest in learning more about the ways that existing research models are similar to CBL and also the particular emphasis that CBL offers. Want a preview? Take a peak at two links on InfoNinja that help boil down some of the basics on CBL and the Research Journey under the research tab ("The Challenge", and "The Journey" The presentation given by Ms. Deaton and Ms. Yarzabek is below. ​a MONSTER of an Event! 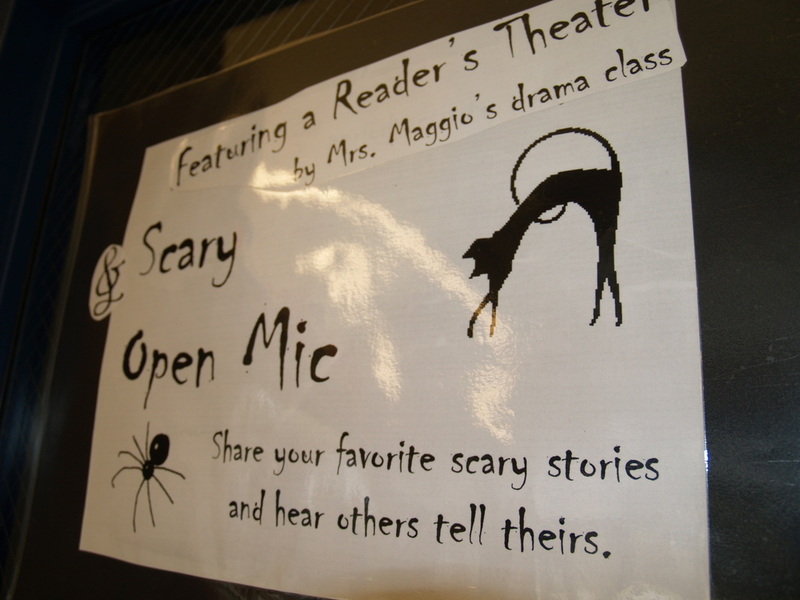 CLICK on the image to above to Learn more about the Bookfair, links to video trailers and author interviews on Scholastic site, and more about the Spooky Reader's Theater on Wednesday, October 28th after school. SO, come visit the library at your SMART LUNCH and check out a great book....maybe even one that someone once challenged. Did you know that libraries are on the front line to protect our freedom of expression & freedom of information, so when Dr. Seuss's Hop on Pop, or the Harry Potter series were challenged by fearful parents, librarians were there to offer some perspective and pause to the censors. Even more shocking is the fact that many people who want a book banned may do so without ever even reading the book in question. While it is true that elementary and middle school libraries take great lengths to choose age appropriate materials for students, what is appropriate for one person may not be appropriate for another. We always encourage kids to think critically in all settings, especially using the Internet, and ask yourself if the content is appropriate. Anytime you find information that is too difficult to read, or you are uncomfortable with because of its maturity level or content, only you can close that window, or put a book back. We want YOU to learn how to make that decision, not someone else. Art Extravaganza & Creativity Coffeehouse! I spent the entire weekend working on a MASSIVE list of books to purchase ($50k) for our library Learning Commons! In need of Starbucks and a little inspiration... I decided to camp out at Barnes and Noble to enjoy this DREAM OF A LIFETIME [for a librarian at least!] The job of putting together a list of books is indeed a dream, but also a mountain to climb. It was a long journey, but our Carroll students and faculty will soon see the rewards! While it does seem like a dream, it certainly cannot realistically be done in a weekend. The journey began several years! A part of the preparation process is to conduct an inventory, an up to date collection analysis and plan, then to do a wide range of eliminating/processing old books out of the collection. The next phase is to recalculate the needs for an upgrade of our collection taking into consideration our school's unique needs and our theme, including a variety of collection analysis tools. The wish lists of students and teachers are factored into the mix too! From 2013, I have been tracking interests and what we need in the library. There are fortunately many librarians and specialists behind the scenes compiling lists of excellent books too (reviewing School Library Journal reviews and compiling Award winning books) which then make it into a the hands of our district library leaders and ME, the school librarian. Result in this past school year? From November 2015 to March 2016 the average age of our library collection went from 1994 to 2004! A jump of 10 years! That is a MAJOR leap forward. We are expecting an even greater leap forward with the inclusion of the latest book order set to arrive this May! 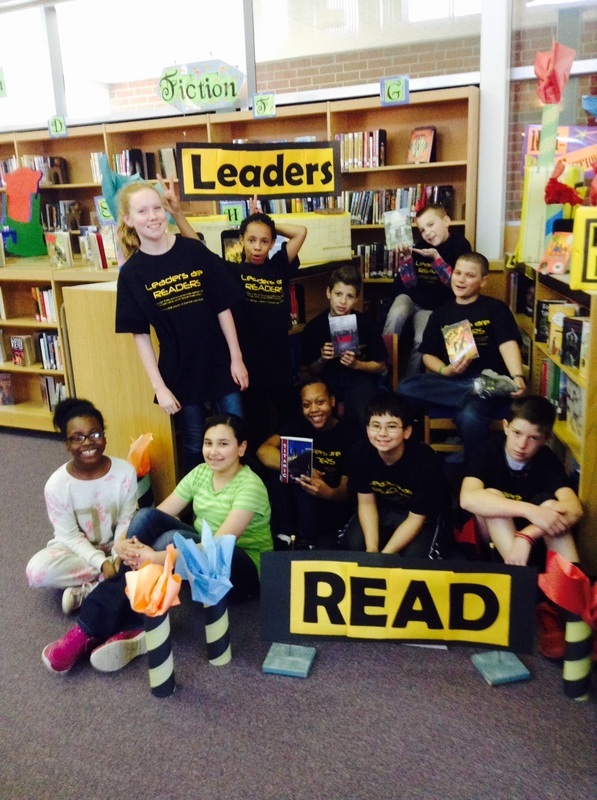 THE VALUE OF A THRIVING SCHOOL LIBRARY! Anyone who has ever picked up a book knows that the library and great books are where we experience WONDER; where we fall in love with great stories, toy with possibilities and allow our imagination room to play. ​We are SO fortunate to be in a district where our library - media center - aka Learning Commons - are supported because they are seen as not only foundations for literacy, but also a life-long skill that feeds our dreams! ​who is going to enjoy your gift by clicking image below. Challenge Yourself! Learn something New! In the spirit of LEARNING.... and our Q2 CBL Theme: Learn, Ms. Deaton pulled out a ukelele and decided to create her own challenge... to learn a new holiday song every day before the break! Dec. 1 was devoted to Jingle Bells... Ms. Deaton gave her 82 year old mother a ukelele and is hoping to do some jamming over the winter break. Ms. Deaton gave her mother a fretless electric bass last year for Christmas and then taught her the bass line to House of the Rising Sun. COOL HUH!!! The key to living a life of Joy is to keep a sense of wonder alive. As long as you have that sense of WONDER and a desire to LEARN.... life keeps going on and on. What Challenge do you have for yourself? Let your imagination run wild! Need inspiration... visit the Inspiration page with a Superbookninja Youtube channel called "INSPIRATION". Go ahead... If you are going to Dream... DREAM BIG! The Carroll Library Learning Commons has gone through a massive upgrade. 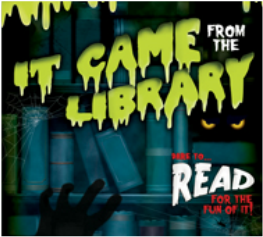 Learn more about how the library serves the Carroll community, and a look at some of the impressive stats on new books, new furniture and more by clicking on the archived newsletter (above). Stay up to date with the latest news, events, etc by book marking this Carroll News Page. One time a year Ms. Deaton offers FINE FORGIVENESS...IF you can clear your account at least one time and show Ms. Deaton. When Ms. Deaton sees that you have returned all books, she will delete (manually) your fines. This is not an automatic gift...you will need to talk to Ms. Deaton about this. The library now has a massive HEART hanging from the ceiling. Did you know that you can heal a broken heart with a book? Reading a book is a deeply immersive experience, and requires some dedication, focus and imagination. There are characters and stories that will change your life. Check out the various sub-themes under the banner "How to Heal a Broken Heart"
Our COUNTRY: Black History...Finding strength and inspiration to Overcome the Struggle. Our FAMILY & FRIENDS: Stories of LOSS (Death, divorce, abandonment), Bullies, and HEALING. JUST YOU & ME: exploring the rocky terrain of romance, boyfriends, girlfriends, breakups, and other tough topics. The Library did something a little unique during the holiday season. 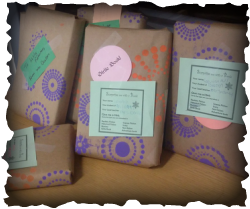 Ms. Deaton gave students a chance to request a "surprise" book that she and her elves wrapped up (with handmade paper!). Ms. Deaton and elves wrapped over 75 books for students. Students came to the library on Thursday and Friday before the winter break to pick up their gift, with the promise that they would wait until Saturday morning, at least, before opening their book. Many students came back after the break with a big smile when they returned the surprise book to the library. 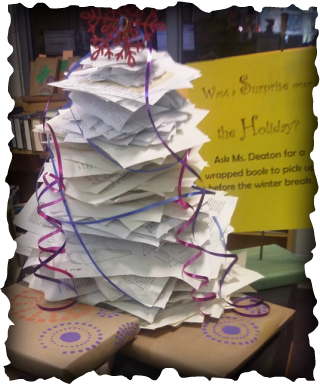 It was such a success that we will plan to do this again next year, and Ms. Deaton may even orchestrate another "Gift of Reading" request system to hand-select books for students. Ms. Deaton said, "I couldn't believe how the thought of unwrapping a book that I selected for students would motivate kids to read! Wow!" Ms. Woodson joked that we perhaps might NOT know if she was the "real" Jacqueline Woodson or not. But, that was at least until she spoke word for word, from her books and by heart. She was the REAL DEAL! In addition to powerfully reciting excerpts from her books including her most recent autobiography in verse, brown girl dreaming, she answered many questions from students. She surprised some students with the fact that she struggled in school and as a reader when she was young, but always knew the power of words and from a young age knew she was a writer. She shared personal stories of her life and how she approaches writing. She explained that writing in verse for her most recent book was a decision she made to capture more of the empty space on the page to illustrate the "dreaming." As for where she starts when writing, she said it is always character-driven. 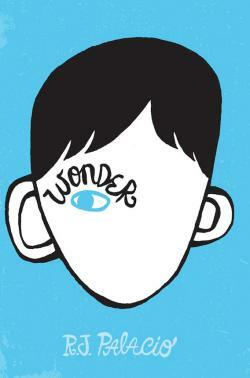 Starting with a character and really understanding their mind and their heart is essential. 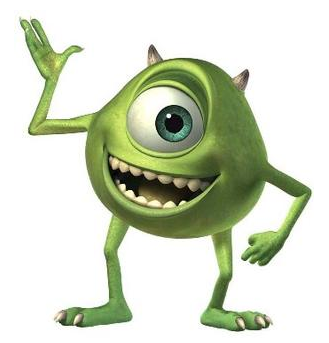 The plot will easily come together if you know your character. She reminded us that all great books contain "mirrors" and "windows". The "mirrors" are the parts of a story that you recognize and identify with. In contrast, the "windows" are the parts of a story that allow you to see far beyond your personal experiences, challenging you with an entirely new perspective. The power of reading is experiencing characters and stories that you may not have a chance to know otherwise which is why she likes exploring people from all walks of life. All were inspired by Ms. Woodson and already many students have come to the library asking to check out a copy of Miracle's Boys, Feathers, Hush, Brown Girl Dreaming. inspiring our students Ms. Woodson!! Carroll's first annual Creative Writing Contest! Are you a creative writer? A Poet? An Author? 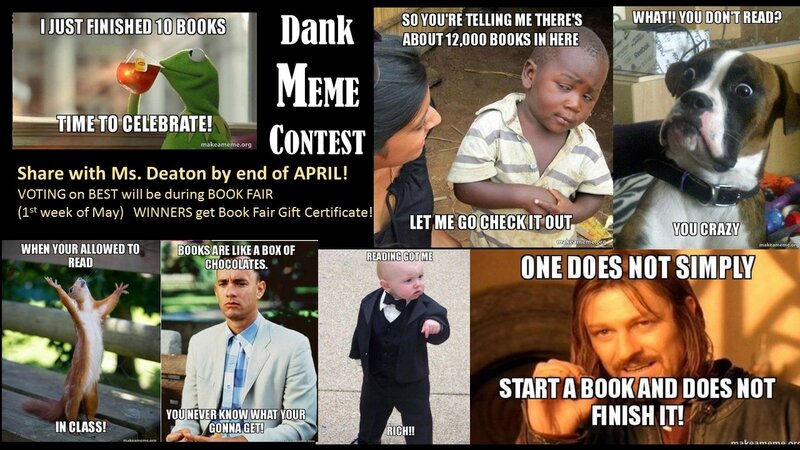 Then submit your finest work by May 22nd to Ms. Deaton on an electronic document file. This isn't a question of books OR technology, but books AND technology! At our foundation is learning, and of course one of the greatest fundamentals is READING. Library -Media Center offering workshops with a technology twist! Students received their NEW SAMSUNG tablets and are SOOOO excited. The "Reader-Leaders" posed with their new tablets...and also some of their favorite books to show that they can love these two things at the same time. Some technophiles think the library is a place of the past and books are irrelevent. So, naturally "old-schoolers" worry that the library will take a serious nose-dive in popularity once new technologies like tablets and little devices take over our lives. WIll traditional reading die? Will teachers want to bring their students to the library to use books? Where to do you stand on the issue? As someone who both loves new tech tools, and also loves to read.... I think that there is room for READING, and in all formats, traditional as well as new. We really need to avoid seeing this as a battle of two opposing technologies. There are simply too many aspects to traditional reading of a book that cannot really be duplicated in other technologies. Clearly one benefit of reading a traditional book is that it is less distracting than other media. It is a great way to unplug from all the other distractions and enter a different world. Reading everyday helps build your IMAGINATION and your ability to FOCUS. And new technologies can help harness our CREATIVITY! And guess what? the library - media center has a foot in both worlds. iPUBLISH - Create an eBook, photo album, journal, recipes, and more! FIND YOUR VOICE: Creativity Workshop. PLay some creativity games and practice using your voice too. Come to the library and Build a Heart at the Inspiration "maker" Station. There are Hearts, inspiring quotes, pens, colored pencils, crayons and glue. There is a BIG-STRONG-HEART for photos so you can make a digital Valentine. Need more Inspiration? 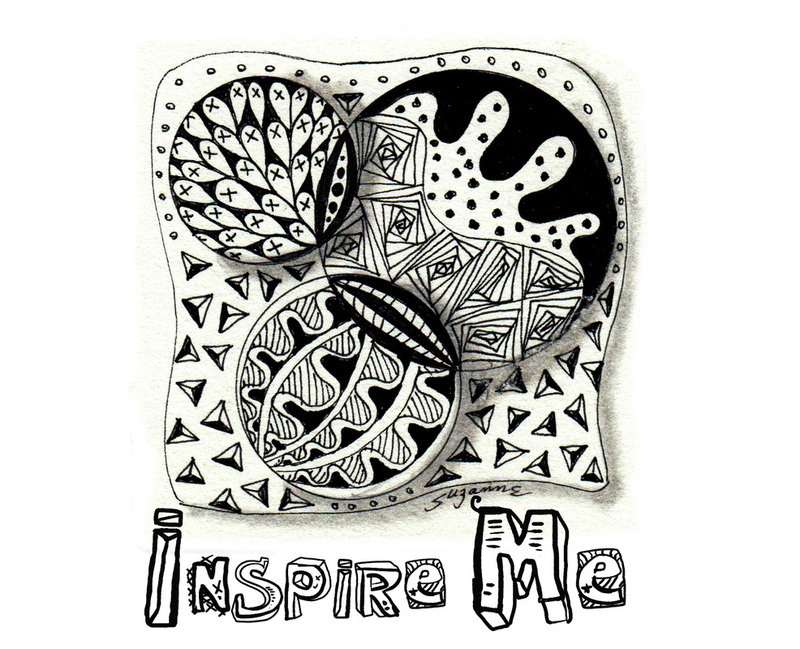 Go to INSPIRE ME on the project page... or click the image below. Follow SUPERBOOKNINJA on Twitter for up to date photos from events. "How to Heal a Broken Heart"
By invitation ONLY (through Language Arts) to celebrate readers. If you are brave, you may be a part of the experience... Don't be Afraid to Readand you may bring a short scary story to share... o.